The final set of Lissa ships have now been released by Spithead, this has been a big project for us and I am pleased that it has come to fruition and grateful to all those who have supported the project. The Lissa series comprises of 8 sets of ships. It has represented a big investment for both ourselves and for our customers who have supported it. I feel it has all been worthwhile as the opportunity of owning a full set of the ships for this fascinating battle will probably never happen again. 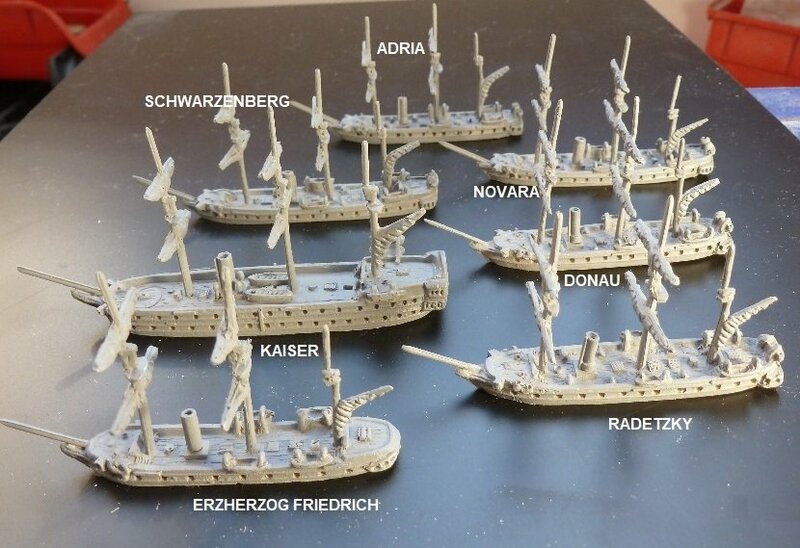 This final set of ships represents the wooden warships of the Austrian second division commanded by Anton van Petz who although out gunned and out armoured he led his wooden warships in a line straight through the centre and rear Italian Ironclad divisions and although his flagship Kaiser was badly damaged she survived the action to sail into Vis harbour for after battle repairs . The Kaiser was so well founded that she would later become an Austrian Ironclad carrying the same name. Spithead plan to introduce some Prussian and Danish warships at a later date that can be used in conjunction with the Austrian frigates contained in this ship set .